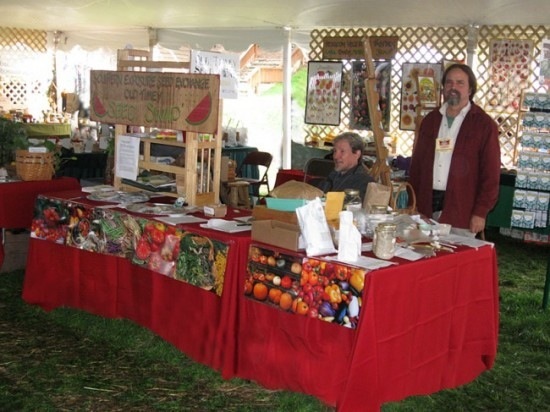 Recently, we here at Southern Exposure have had the pleasure of participating in two lovely, sustainability-focused events: our 4th annual Heritage Harvest Festival, held at Thomas Jefferson’s Monticello right here in Virginia, and the inaugural Mother Earth News Fair at the Seven Springs Resort southeast of Pittsburgh. Thomas Jefferson was an avid gardener and agriculturalist and, if alive today, would surely be a passionate advocate of the organic food movement. 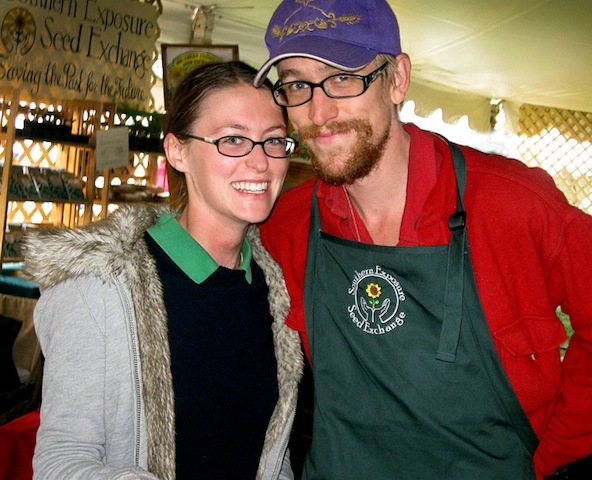 In honor of this, Monticello and Southern Exposure have been co-hosting the Heritage Harvest Festival (HHF)–a celebration of local food, gardening and sustainable agriculture. On Saturday, September 11th, 3,000 people flooded Monticello’s West Lawn to attend workshops and hands-on demonstrations as well as to admire Jefferson’s beautifully-restored gardens. Experts from around the country shared their knowledge with participants at a variety of wonderful lectures. Among these master gardeners were our very own Ira Wallace and Ken Bezilla. 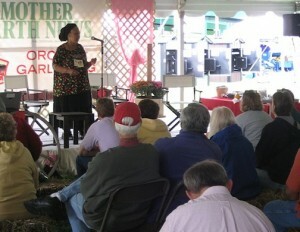 Ira educated listeners about heirloom garlic and later, she threw a tea party! At her workshop Herbal “High” Tea, Ira served fancy herbal teas and delicious anise cookies while teaching participants how to grow the herbs needed to make such sweet and savory delights. 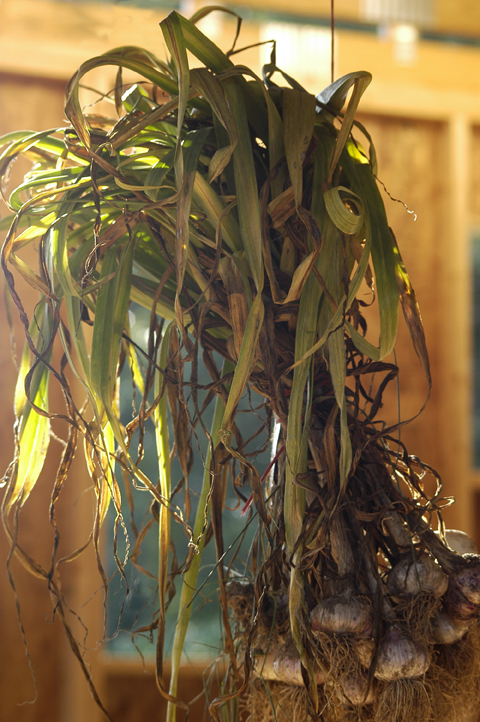 At Ken’s lecture, he delved into fall and winter gardening for Zone 6. Besides recommending winter greens and roots that participants could begin growing as well as naming crops such as garlic and onion that could be started for next year, Ken talked about frost preparation for summer crops, row cover, and what to do for your plants when it snows. Over at our Southern Exposure booth, we hosted pepper, melon and tomato tastings that enveloped us in a flurry of activity all day long. 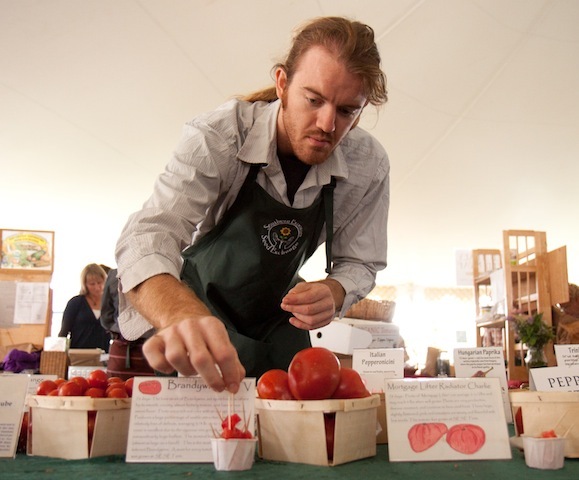 The continuous stream of people wanting to try our numerous heirloom tomato varieties kept our ex-line cook Andros chopping tomatoes at lightening speed for hours. The first ever Mother Earth News Fair, held at the Seven Springs Resort in Pennsylvania, was a huge success, with over 9,000 participants and nearly 200 workshops. The fair was a hands-on sustainable lifestyle event that featured an eco-friendly marketplace, organic and local food tastings, and lectures by leading authorities on gardening, green building and renewable energy. We’re glad we got to be there and that we were asked to be a Supporting Partner of the event. An entire table of our booth was dedicated to seed swapping. We happily looked on as friends of Southern Exposure exchanged all sorts of seeds, from passion fruit to wildflowers, amongst each other. People perusing our booth could also sample squash, tomato, pepper and garlic varieties–all of which we grew in our garden. And Ira, ever a fountain of useful information, gave four lectures. Ira's lecture "Growing Great Garlic and Perennial Onions"
When she wasn’t teaching attendees how to grow garlic, perennial onions, herbs and heirloom tomatoes, she was instructing people on how to eat fresh from their gardens all winter long. If you missed the fun in Pennsylvania, come visit our booth next year! We’ll definitely be back, and with even more Southern Exposure goodness. 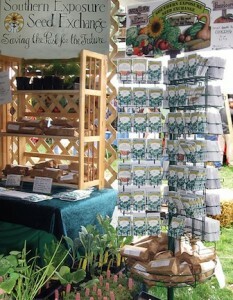 June 4-5, 2011 – Seattle Metro Area, Puyallup Fairgrounds, Puyallup, Wash.
Sept. 3-5, 2011 – San Francisco Metro Area, Marin Center, San Rafael, Calif.
We’re donating ten percent of our sales from winter events to the Organic Seed Alliance, so come on out and celebrate seeds with us! Inchelium Red won first place for flavor at the Rodale Food Center. Growing garlic is a great way to spice up your garden. And your kitchen! If you’re a garlic lover, having your own garden is an absolute must. There are tons of garlic flavors that you just can’t find at a supermarket. 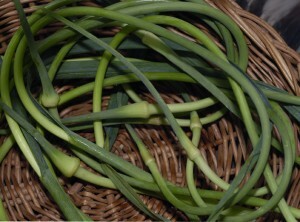 From kid-friendly, mild-flavored Elephant Garlic to intense, fiery-hot Red Toch Garlic (go ahead and try it…I dare you! ), there’s a different flavor for every taste. 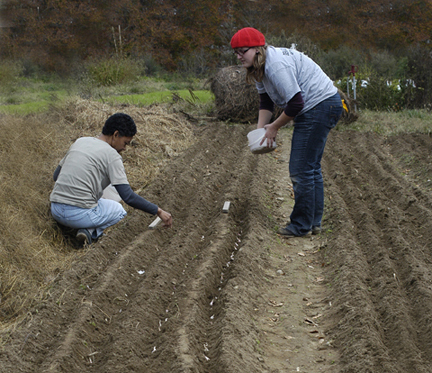 It is best to purchase garlic seed from a source that you trust. Using cloves that you buy in the supermarket CAN work, but you run the risk of introducing diseases into your garden. You also run the risk of buying a bulb of garlic that has been chemically treated to never sprout. Is planting supermarket garlic really worth the risk? 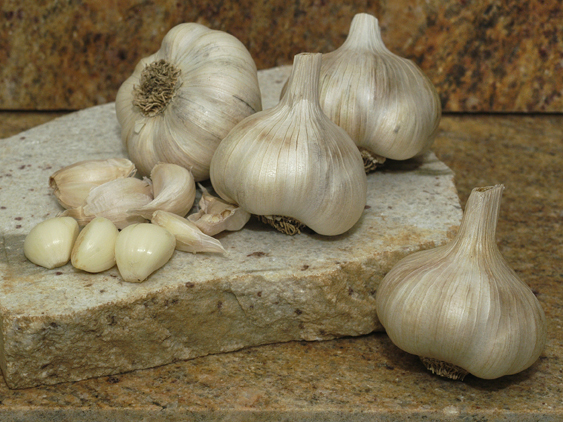 You have three main options when selecting a garlic variety: Softneck, Hardneck, and Asiatic. 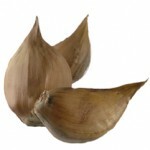 Softnecks include silverskin and artichoke types of garlic. These varieties are the most domesticated. They are among the easiest to grow, and are among the highest yielding. But be aware: Softnecks don’t do too well in extremely cold climates. 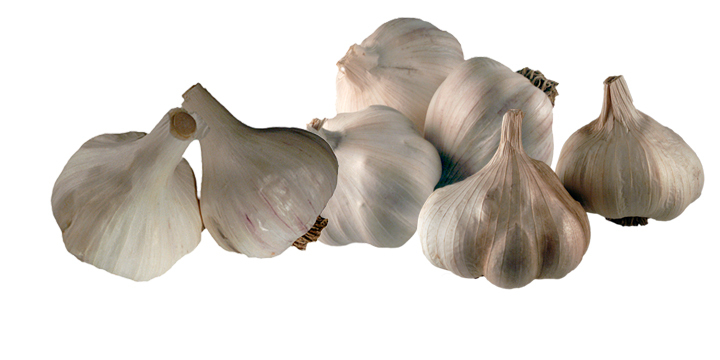 Inchelium Red, Italian Softneck, Loiacono, Red Toch, Silver Rose, and Silverwhite Silverskin are a few varieties of Softneck garlic. Hardnecks include Rocambole and Topsetting types. These varieties are enjoying a gourmet renaissance. The cloves are large and easy to peel. Hardnecks grow better in colder climates than warmer ones. 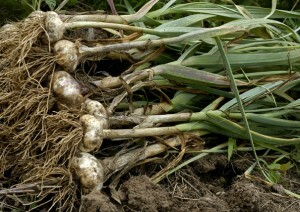 For these garlic varieties, it is best to plant large cloves. 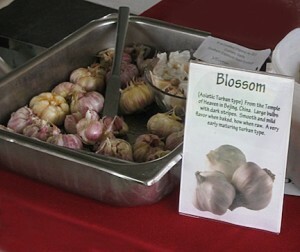 Appalachain Red, Music, Persian Star, Chesnok Red, and German Extra Hardy are varieties of Hardneck garlic. 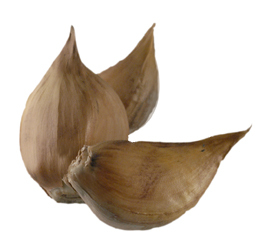 Asiatic or Turban types of garlic are considered a subset of Softnecks. These are the first to mature in the garden. In warm climates they act like Softnecks, whereas in cold climates they act more like Hardnecks. Varieties include; Xian, Asian Tempest and Blossom. You’ll be planting garlic in the fall. 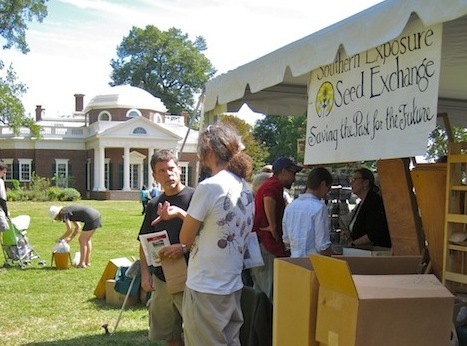 Southern Exposure caters to Mid-Atlantic gardeners. So, we recommend that most of you plant in late autumn, usually this means planting garlic between Columbus Day and Halloween. However, if you’re a little farther north, your garlic cloves are better planted earlier in the season. The first thing you’ll need to do is separate the individual cloves from the bulb. This only takes about a minute or so. Be sure to leave the paper (the thin, papery skin) on the individual cloves! Garden bed prep is going to take somewhat longer. Garlic really benefits from compost early in its development, so you’ll want to be sure your garlic beds have a good, thick layer of compost when you first plant. Adding nutrients later would not be as helpful. If you have a rototiller, toss some compost on there and go for it! If not, you can aerate and mix the nutrient-rich compost into your soil with a broadfork. Next, dig your furrows with a warren hoe. 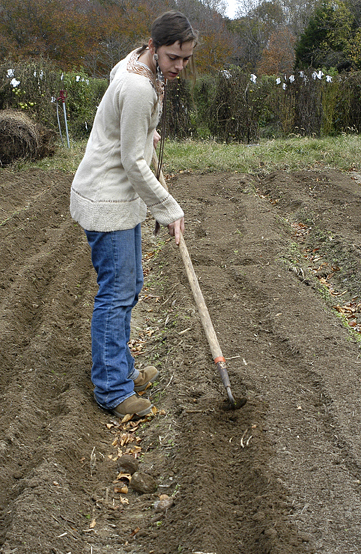 Mark the line you’ll be planting along by dragging the tip of the hoe down the length of the bed. Then, using more pressure, dig your trenches. A couple of inches deep will do. Place the garlic cloves upright (with the paper still on) into the deepest part of the trench. The bottom of the clove will put down the roots, and the pointy top will sprout the leaves. Plant the cloves about six inches apart. If your beds are three feet wide, you can usually fit four rows. After the garlic is in the ground, use a paddle hoe to cover the garlic and level the trenches. The next crucial step is to LABEL your newly-planted garlic, as it will be some time before harvest. After about a month, it’s time to join the garlic liberation front. Your garlic should be starting to sprout, so help the new leaves find light by making a hole in the mulch for them. What’s next? Learn a foreign language, rebuild a hot rod, or clean out the attic…you’ll have months before your garlic needs attention again. In late spring, it’s time to weed. If you mulched like a champion, this shouldn’t take too long. 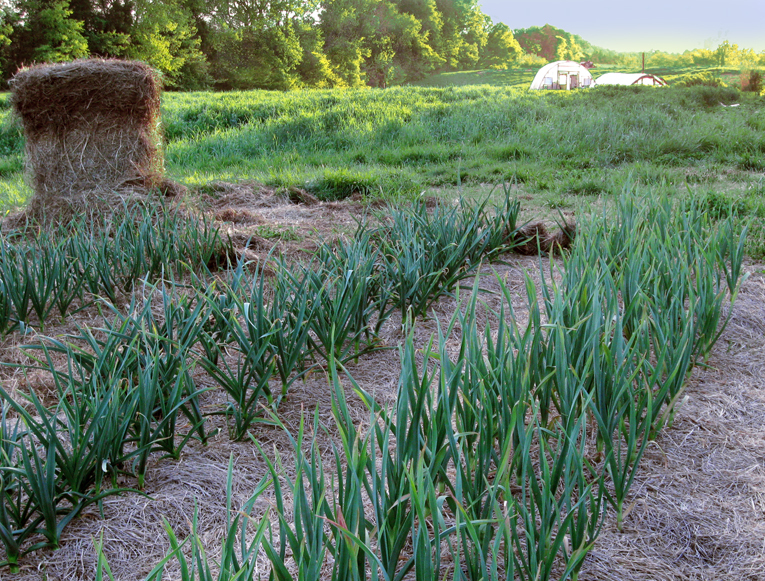 When early summer arrives, but later than the Fourth of July -for the Mid-Atlantic it will be time to harvest your garlic. When garlic is ready, there will typically be only six leaves left on the plant. Get your pitchfork and dig about three inches in front of the stem. You’ll want to give your garlic a nice, wide berth. After all this work, it would be a shame to impale your plants! 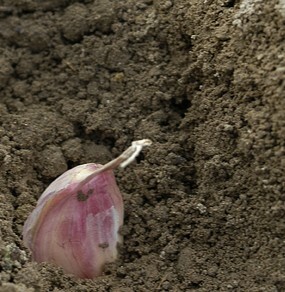 Loosen the soil around the garlic and pull it carefully out of the ground. If you want to make sure that the garlic is ready to be harvested, cut the bulb down the center to see if the cloves are fully formed. If so, continue digging. If not, try again in about a week. At this stage, garlic looks like it’s ready to try out for the Steelers. The bulb will be big, burly, and tough-looking. But it’s not actually that tough! The bulb is easily bruised and damaged, so handle gently. And no tossing! 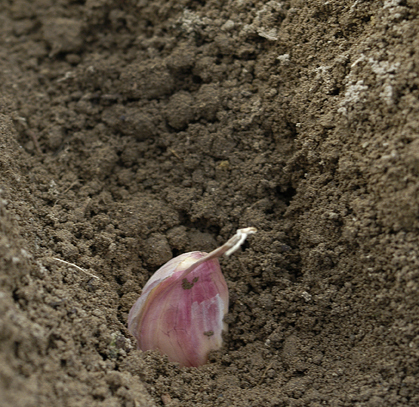 Place each dug-up plant–with the roots and leaves still attached to the garlic bulb–in a pyramid formation. (Instead of going out for football, they should really consider cheerleading.) There should be space between the bulbs on each row. Now, tie up your garlic and hang it out to dry. By mid-summer, your garlic should be cured. Cut off the roots and stem, and store your garlic in a cool, dry and dark place. Finally, it’s ready for consumption! If your garlic grows well and you get a bountiful harvest, save some of the cured bulbs to plant the next year. 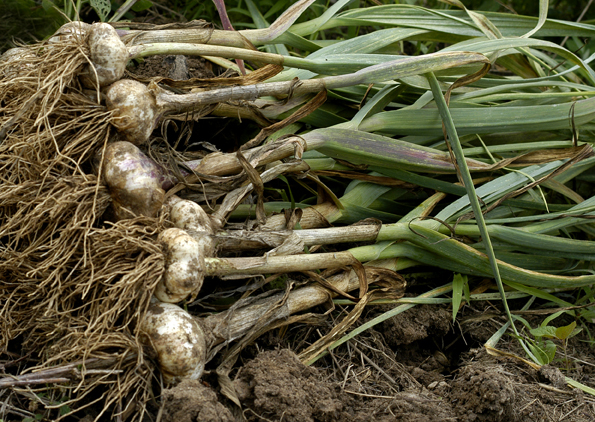 Replanting garlic that has grown well in your garden will only make it even better next year. In time, selectively saving your own garlic seed will produce garlic that is custom-designed to grow fabulously in your garden, year after year! Not all mulch is created equal. Types of mulch range from great to not-something-you’d-want-in your-garden. If you’re looking for a rich, black mulch containing ample nutrients for your plants, the answer is simple—use garden or kitchen compost! If you’re going to compost organic materials yourself, make sure to have just the right balance of brown (carbon-rich) and green (nitrogen-rich) materials, so that your compost will break down efficiently. If you don’t have a lot of material to work with and if quick-and-easy composting is of the utmost importance to you, you might want to invest in a compost tumbler. But here at Southern Exposure, we do it the old-fashioned way! If you, too, have an open-style bin, make sure to turn it with a garden fork every two weeks to aerate the pile and to move dry material from the outer edges to the center. 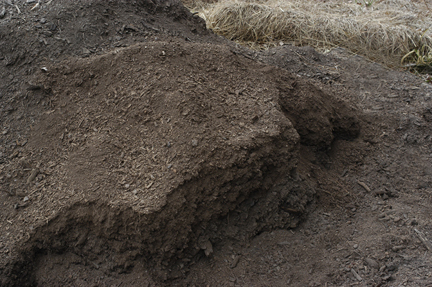 You’ll know when your compost is ready because it will look beautifully dark and crumbly, and should smell earthy. Still see an orange peel? It’s not done! You definitely should not be able to pick out any original ingredients. If you don’t have the time or means to make compost yourself, give your township a call. Many municipalities compost the yard waste they collect and then offer the finished product back to their residents. …it’s also for your garden! 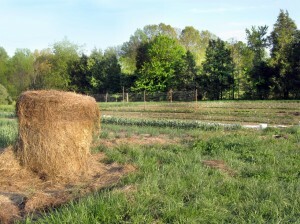 Here at Southern Exposure, we often use hay and straw to mulch our crops. Hay comes from grasses and legumes such as alfalfa or clover that are cut, dried, and used to feed farm animals. Straw, on the other hand, has little to no nutritional value for animals–it is made from dried, mostly-hollow stalks of grain. Straw and hay make for different mulching experiences. 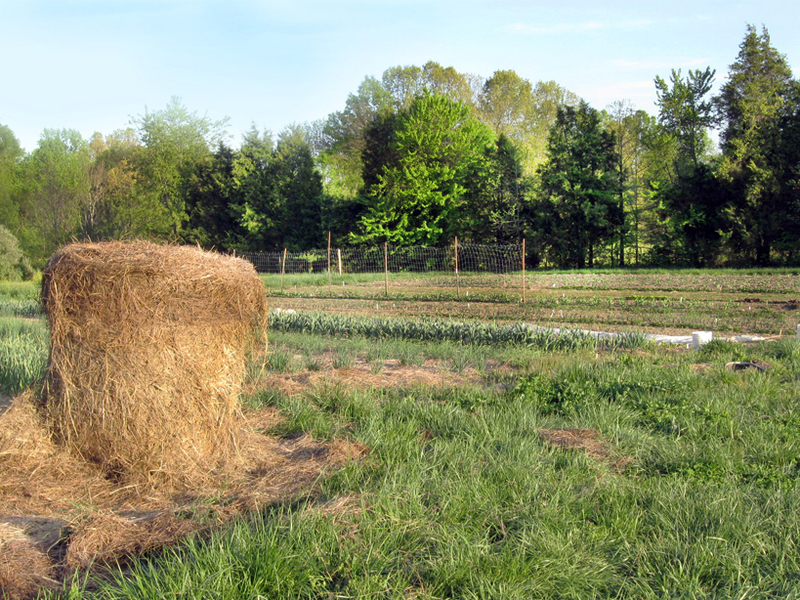 Hay is nice and heavy, so it is likely to stay put once placed in your garden. 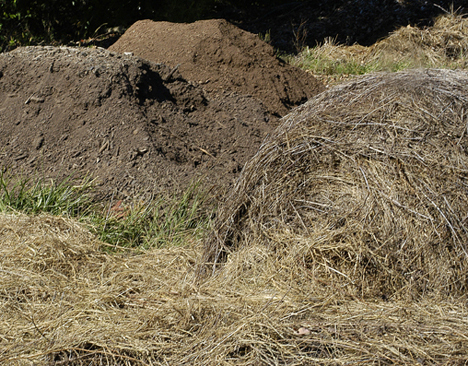 However, when mulching with hay, be aware that it could contain weed or grain seeds that may eventually sprout. This is not really an issue with straw, but straw is much lighter than hay, which means that you’ll have to use a lot more of it to get it to stick around come wind and rain. If you’re a fellow resident of Virginia, where live oaks are commonplace, you might want to try using oak leaves as mulch. Live oaks are classified as evergreens because they hold onto their leaves all winter long…but come springtime, keep your eyes peeled! You won’t have to look very hard to find fallen oak leaves in abundance, as live oaks drop their leaves over a two-week period each spring. Oak leaves add acidity to soil, so make sure you’re using them on plants that can tolerate this. You can either directly mulch your garden with oak leaves, or compost them first (chopping them up with a lawn mower or other tool will help them to decompose faster, as will mixing them with nitrogen-rich materials). Using pine needles as mulch, which is often called pine straw, is a good idea when you are looking to increase the acidity of your soil. Garlic, mint, onion, blueberry and tomato plants would appreciate this, as would azaleas, chrysanthemum, rhododendron, and roses. And besides giving certain plants their acid fix, pine needles bind together to provide a weed-suppressing blanket that is unlikely to wash away with heavy rains. Another great thing about using pine needles as mulch is that you can easily collect it yourself. Even if you don’t have pine trees on your property, neighbors with pines might happily agree to let you scoop needles off their grass—the needles’ high acidity makes for splotchy lawns! 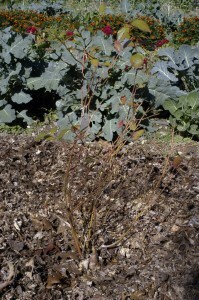 Wood mulch is a common type of mulch because it’s good at suppressing weed growth. 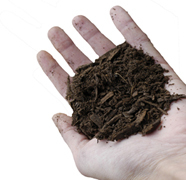 But if you’re planning on buying commercially produced wood mulch, be aware that it may be made out of trashed wood, which could add arsenic and other chemicals to your soil. 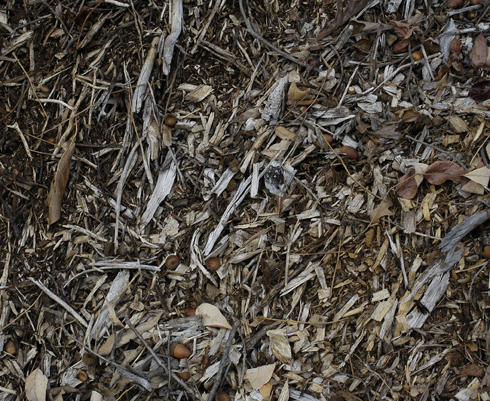 Also, if you want to avoid moldy mulch, using wood chips as mulch might not be the best choice. Now, some molds and fungi—natural aspects of the decomposition process for all organic material—are benign or even beneficial for plants. But others are nuisances. Case in point: wood mulch can breed a nasty mold called “shotgun” or “artillery” fungus, which leaves impossible-to-remove spores that look like balls of tar on homes and cars. 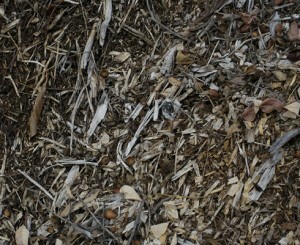 If you’re still into the idea of using wood mulch, why don’t you try sawdust? The founder of Southern Exposure originally used sawdust as mulch in his garden, and he had no problems with it. Rubber Mulch: Old Tire Chunks on Your Plants?! For instance, did you know that many types of mulch you can buy in the store are thickened with ground rubber, potentially from used tires? Though rubber mulch might be good for playgrounds (if you don’t mind exposing your kids to the chemicals components of artificial rubber, but hey—we’re not talking child rearing here), it simply does not belong in your garden. The cons of using rubber as a mulch ingredient far outweigh the fact that rubber contains a small amount of nitrogen. Zinc, cadmium and other heavy metals from rubber mulch could seep into your soil. Plus, it stinks in the heat! What’s Mulch Got To Do With It? In conclusion, we just want to reiterate something you’ve hopefully already figured out—mulch is very important! 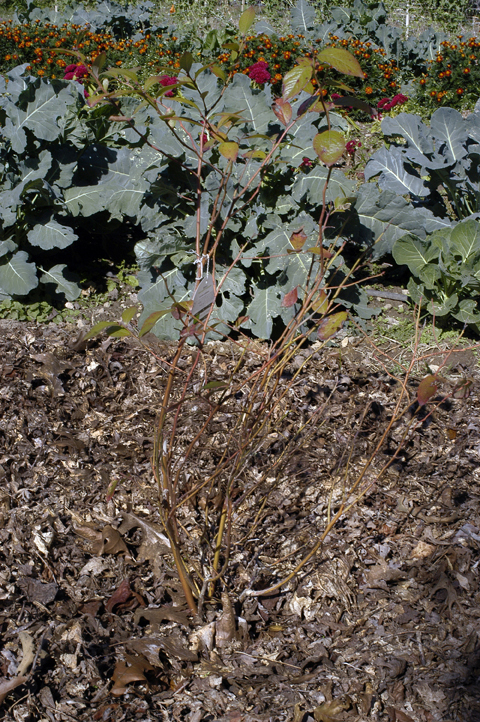 All mulch types help soil and root health by retaining moisture, managing temperature, and preventing weed growth.